I like working with the thin applications of masking frisket. The curved trajectory of the traces form regular beads of fluid, which become the source of intersections, when I jostle the paper from side to side. After my frisket network dried, I dripped ink into its midst. I used sepia and blue inks. They mixed very well with the aureolin yellow, forming greens and greenish browns. Next came red ink, which yielded purples and oranges. I like the color distribution across the breadth of this composition. I’m also glad I stopped before muddiness ensued. 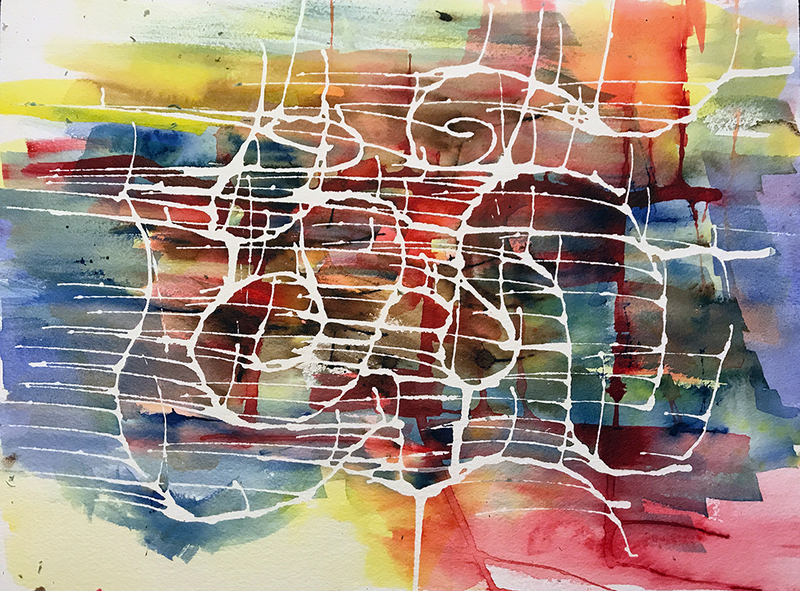 This entry was posted in Personal Stories and tagged abstract art, artistic process, city streets, creative process, creativity, frisket, ink, thin traces, visual arts, watercolor. Bookmark the permalink.